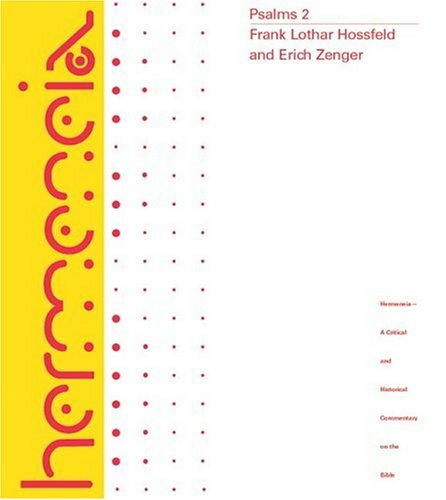 I have just started working my way patiently through Hossfeld and Zenger's wonderful new Hermeneia commentary on Psalms 51-100 (the first volume of 3, translated from the Herders Theological Commentary in German). I am often asked about the value of commentaries. Clearly they are important for scholars and students. But preachers should not ignore the riches found within them. Detailed exegetical commentaries offer innumerable insights for theological reflection, and observations that might help to frame the language and structure of a given sermon. So here are some of the things that have struck me as I have looked at Psalm 51 (in Christian tradition the Miserere). All citations are to the MT, and I make no apology for the use of Hebrew. It is only by understanding Hebrew that one is able to understand the points being made. This is the main reason why, in my view, biblical languages are still essential for anyone wishing to spend a lifetime in responsible interpretation of the bible within the community of faith. In the NRSV this is translated: 'when the prophet Nathan came to him, after he had gone in to Bathsheba' but this downplays the wordplay in the repeated verb. There would be an idiomatic way of preserving the word play in contemporary English, but it would be a brave pastor (or commentator or translator for that matter) who would take that option. 2. The phrase לְךָ לְבַדְּךָ חָטָאתִי in 51.6 expresses a fundamental conviction of post-exilic theology, namely that sin against neighbour is to be understood as sin against God (cf Lev. 5.21). The canonical context of the phrase relates it, of course, to David's sin against Bathsheba. 3. The Psalm permits of an interpretation in which the problem is not only sin, but sickness. Hossfeld and Zenger convincingly argue against this interpretation (clearly the focus on the text is on sin and penitence) but the presence of v10 with its reference to crushed bones, and the clear connections between sickness, impurity and sacrifice in OT thought, there is something to be said for keeping this in the background of one's reading of the text. In particular, the suggestion that God's refusal to take pleasure in cultic sacrifice (51.18) is due to the fact of the Psalmist's illness and thus impurity is suggestive. 5. The opening verses, with their threefold description of sin (as transgression of the divine order; deliberate injury or harm and deviation from the true path and goal of human life) and threefold description of God's characteristics, echo the 'mercy formula' known elsewhere in the NT (see e.g. Exod. 34.6; Jonah 4.2). In standing at the Psalm's opening they set the context for the later statements about the justice of God's judgements: 'God's righteousness is merciful and effects mercy as God combats and eliminates sin in its multiform wickedness and destructiveness' (Hossfeld and Zenger, Psalms 2, 19). 6. 51.7 with its reference to being born in guilt concerns the givenness of sin rather than offering an explanation for the origin of sin. There is no understanding of sin as passed through the act of procreation here. 7. Hyssop אֵזוֹב is wild oregano and is used in Leviticus 14 as one of the ritual elements taken my priests into a house rendered impure by disease. And all that just from vv1-11 (51.1-9 in the English). More later.